We were introduced to this book in the Christian Classics Study Group, where we read small parts of this book. Since then I read the whole book, and below is my review, originally posted on Goodreads. This was very interesting and enjoyable to read. It was good that this copy also included an introduction, because otherwise I might have stopped reading in the beginning, because he turns the biblical history into such a polished story. Knowing that that was common in those times was helpful for me. This booklet is a very friendly and elaborate answer by Gregory to a question of a young friend who wanted to know how to live virtuously. 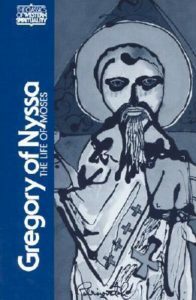 In answer to that question he describes the life of Moses, and explains how we can apply all his history allegorically to the whatever happens in our souls during our spiritual journey. Very much in the beginning, he defines perfection as growth in goodness. That is: humans can never be perfect, because we are finite, so there will always be something greater, but we can always be in the process of becoming better. This idea comes back in his explanation of the event when Moses asked to see God, and was granted to see his back. He says it means we should always be following God, and also that we will always desire to see more. For me personally, this idea that perfection is in the ongoing process of spiritual growth, is very reassuring and helpful. It gives a certain rest that God is not asking the impossible (perfection), and also a wide perspective into a future that will never become boring.